It seemed simple at first, then he grabbed me....or the Lord did. "Failure, sin, and error do not happen because I get lazy; they are a part of being a fallen person in a fallen world. ""God expects more failure from us than we do from ourselves because God knows who we are." Basic truths (hence lower rating) but really good reminders that I know but need to really KNOW AND BELIEVE. At the beginning of this book, Smith discusses the fact that he isn't coming up with new ideas. He explains that he has benefited greatly from Christian thinkers such as Brennan Manning, Henri Nouwen, and Thomas Merton. He is correct; their influence is obvious.That being said, Smith does a wonderful job of summarizing their messages without simply copying their styles. 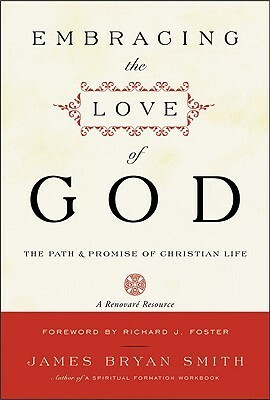 He does go over many of the same themes [embracing weakness, resting in the love of God, loving others as we have been loved, etc] but does so in a way that is much more practical than any of those authors ever were.Overall, a very solid book that I immediately handed to a student to read, which is a great sign of my approval. One of the best books I've ever read on being loved by God as a basis for loving, accepting, forgiving, and caring for ourselves and others! Renovare selection that was a good basis for a preaching series. After the bible, this is the most important and life changing book I have ever read. A must-read for every Christian. James Bryan Smith - James Bryan Smith (M.Div Yale University Divinity School, D.Min Fuller Seminary) is a theology professor at Friends University in Wichita, KS and a writer and speaker in the area of Christian spiritual formation. He also serves as the director of the Aprentis Institute for Christian Spiritual Formation at Friends University.A founding member of Richard J. Foster's spiritual renewal ministry, Renovaré Smith is an ordained United Methodist Church minister and has served in various capacities in local churches. Smith is also the author of A Spiritual Formation Workbook, Devotional Classics (with Richard Foster), Embracing the Love of God, Rich Mullins: An Arrow Pointing to Heaven and Room of Marvels.